THE Ulster Automobile Club (UAC) has announced plans for an Easter Rally, which will feature as Round 2 of the Irish Tarmac Rally Championship and Round 3 of the Northern Ireland Stage Rally Championship. 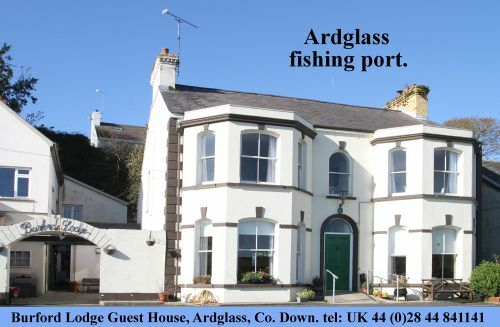 Lisburn and Ballynahinch will be the anchor towns for the one-day event, which will cover twelve stages over a lengthy 100 competitive miles within the counties of Down and Antrim on Easter Saturday, 30 March 2013. Over 100 national and international competitors are expected to take part in the event, which will delight rally fans throughout Ireland who turn out in their thousands each Easter to enjoy a rally spectacle. The rally will start in Lisburn City Centre at 9.30am with the ‘ceremonial start’ that will see cars leaving Bow Street at regular intervals until around 11.30am. 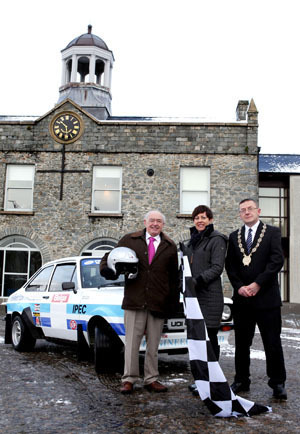 Chairperson of Down District Council, Councilor Mickey Coogan said: “We look forward to welcoming the Easter Stages Rally to Ballynahinch and are delighted to be supporting this exciting event. “This too will provide a boost to the local economy which hopefully will continue with our extensive festival and events programme throughout the district,” he said. Ballynahinch will also host the rally service area where competing teams will be based throughout the day, at the Millbrook Lodge Hotel. Lisburn City Council Economic Development Committee chairperson Alderman Jim Dillon, rally driver Caroline Spers and Down District Council chairperson Councillor Mickey Coogan in teh Market Square in Ballynahinch launch the Easter Stages Rally. “I am delighted that Lisburn has continued its links with the organisers of the Easter Stages Rally,” said Alderman Jim Dillon, Chairman of Lisburn City Council’s Economic Development Committee. The rally will conclude in Ballynahinch that evening with cars expected to arrive from 5.45pm onwards. The finish podium and customary spraying of champagne by the winners, will take place in the town centre at Market Square.